Ritham Special School run by Ritham Charitable Trust is among the reputed Special Schools in Rajapalayam region, Tamil Nadu. Started by Mr. Venkataramanan and his father in 2004, the School takes into consideration the needs of children who are Mentally Challenged or affected with Cerebral Palsy (non progressive neurological physical disability). These medical problems are incurable and the medical intervention is limited to treatment and prevention of possible complications. The Trust believes that these Special children deserve to be educated and trained to support themselves and lead a dignified life. The syllabus is thus designed on the basis of the severity of disability, the environment at home and the I.Q level. It includes self-dependence, etiquette, conversation and everyday activities. By the end of Mar 2013, six students have successfully passed the 8th Std. The teacher student ratio is 1:10 in an endeavor to give personal responsiveness to each child. This ratio is in line with The Research Society for the Care Treatment & Training of Children in Need of Special Care, one of the oldest and largest organizations in country serving children and elderly with mental challenges and other related disabilities. As per unconfirmed reports, other Schools for children with special needs which are operational in the same area have a teacher student ratio of 1:40. The children are trained to deal in money via a shopping model. Under this model, these children are provided with fake money and are asked to do transactions. Once in a week, stalls are put up and the children are encouraged to transact with real money. The Trust aims at preventing children from being a burden on their families and making them aware of their inherent abilities, skills and talents. Posted an income of Rs1.2mn in FY12, of which 37% is through individual donations, 36% through beneficiary charges in the nature of school fees and 25% through Government Grants. The sector average for FY12 is 43%, 21% and 26% respectively. Nearly 70% of the individual donations in FY13 have come through GiveIndia as compared to 35% in FY12. 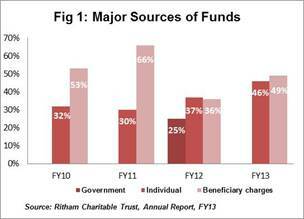 Major source of income for FY13 continues to be individual donations (46%) and beneficiary charges (49%). Beneficiary charges include school fees, and transportation charges. (Ref Fig 1). Salaries accounted for a sizeable percentage of (Rs0.7mn, 61% of total expenses) in FY12. This 3x increase in salaries in FY12 as compared to FY11 (Rs0.2mn, 50% of total expenses) can be attributed to the salary grant received by Government in FY12. The FY12 figure includes the grant receivable in FY11. 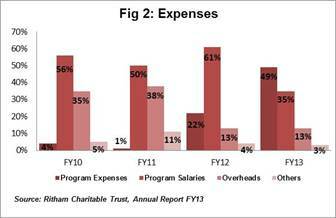 Program expenses accounted for 22% of total expenses in FY12 and 49% in FY13. This increase is on account of free education and transportation provided to students with special needs from economically backward families. Overhead expenses have decreased from 38% in FY11 to 13% in FY12 and FY13 thereby indicating more effective utilization of funds. (Ref Fig 2). Cash and bank balance comprises 43% of total assets in FY13 and have increased from Rs72,000 in FY12 to Rs0.3mn in FY13. This is on account of funds deposited in bank for the purpose of buying land for future expansion. The Trust has not yet started building a corpus fund. Total income has shown a sharp growth of 116% in FY12. This can be attributed to the government grant and large individual donations through GiveIndia received in FY12 for the first time. The income growth rate has recorded a slight decrease of 5% in FY13. There are around 109 students in the School of which 32 are from well to do families while the remaining come from underprivileged backgrounds. There is a steady flow of income in the form of school fees and transport charges from the 32 children, which is used to subsidize the other children. The self-sufficiency ratio is 1.1x in FY13 as against 0.8x in FY12 (ratio measures how much of expenses can be met from own income – individual donations/corpus income/fee income). This y-o-y increase is attributed to increase in individual donations and beneficiary charges in FY13. The repayment capacity ratio measures ratio of own funds to total borrowings. (Own funds includes corpus funds and accumulated funds and excludes unrestricted funds) This ratio was 9.3x in FY13 as compared to 4.1x in FY12 thereby indicating the organization’s ability to pay off its relatively marginal debt (Rs0.1mn in FY11 decreased to Rs70,000 in FY12). Lack of awareness regarding mental disability in semi urban and rural areas. Reluctance of parents to accept the mental state of their child and admit them in a Special School. High staff attrition due to unattractive salary. The Founder Mr. P.S. Kathiresan is a retired headmaster from Tamil Nadu Government and has been awarded ‘Best Teacher’ awards by both Central Government and Tamil Nadu State Government. Mr. Venkatramanan, a physiotherapist by profession is the co-founder and holds the position of School Principal. Ritham Special School has been awarded the Best ‘Special School of Tamil Nadu State’ in 2006 and the ‘Best Social Employer’ in 2009.